Drawing on newly discovered sources and writing with brilliance, drama, and profound historical insight, Hugh Thomas presents an engrossing narrative of one of the most significant events of Western history. 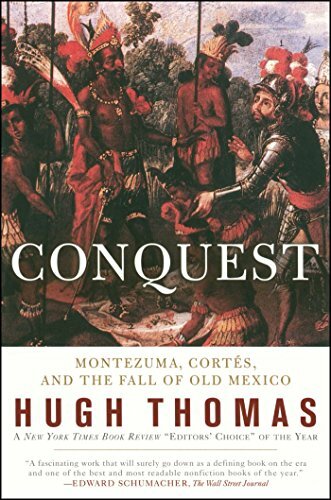 Ringing with the fury of two great empires locked in an epic battle, Conquest captures in extraordinary detail the Mexican and Spanish civilizations and offers unprecedented in-depth portraits of the legendary opponents, Montezuma and Cortés. Conquest is an essential work of history from one of our most gifted historians. Edward Schumacher The Wall Street Journal A fascinating work that will surely go down as a defining book on the era and one of the best and most readable nonfiction books of the year. Alfred MacAdam Newsday Conquest makes such exciting reading one forgets that these things actually happened. Hugh Thomas documents characters and events in as much detail as humanly conceivable....Monumental. Thomas Christensen San Francisco Chronicle Thomas balances writerly skill, exhaustive research, and scholarly documentation to make his book as useful as possible to both general and more involved readers....Essential. Christopher Lehmann-Haupt The New York Times So dramatic is the account in Mr. Thomas's telling, that...you almost don't want to give the story away....Compelling recounted. Wendy Smith Chicago Sun-Times Thomas does full justice to a titanic subject in his vigorous narrative, which contains enough heroism, cruelty and pathos for ten Greek tragedies. Hugh Thomas is the author of The Spanish Civil War and other works, both nonfiction and fiction. He lives in London, England.